For this restaurant, concrete floors were used because of the industrial and marine heritage of the site and also because they are environmentally sound. Subtle changes in the depth of color in specific areas were created by layering and blending different colored stains. Stains reacted differently in certain areas because not all the concrete had been poured at the same time and therefore, had different mix designs. The biggest challenges on this project were the tight timeline and the unpredictability of reactive acid stains. The rich, variegated patina of stained concrete creates a feeling of warmth and antiquity for Latitude 43, a new dining destination overlooking Gloucester's working waterfront. Naturally, the focal point of the diverse menu is fresh seafood. The design firm of Poore & Company specified stained concrete to reference the industrial and marine heritage of the site. 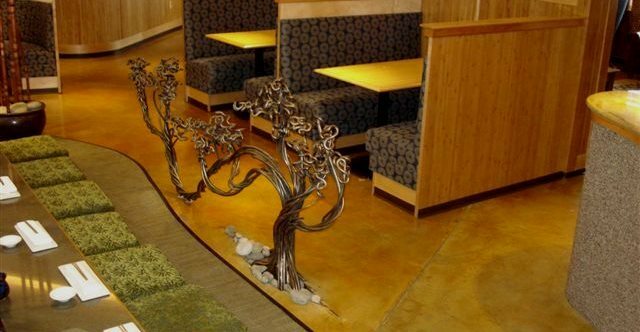 They decided to finish the concrete floors, because concrete is an environmentally sound, green building choice in keeping with the business philosophy of the owner. 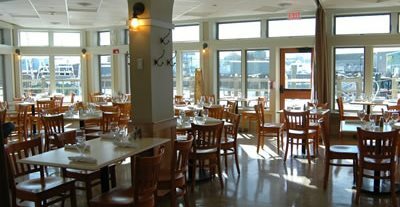 Creating the upscale restaurant complex on the main street in the coastal city of Gloucester, Massachusetts, was an ambitious renovation project completed in January 2008 to provide several distinct destinations within one restaurant. The main dining includes both waterside dining and a cozy living room with a fireplace. This adjoins a sunken sushi area and a generous bar. A traditional pub with its own classic menu is another attraction within the complex. 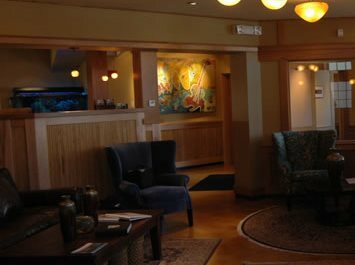 The dining areas and entry incorporate warm woodwork and colorful accents in a clean contemporary setting that showcases original paintings and sculptures produced by local artists. 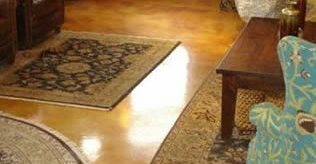 Stained concrete is used for half of the 6,000 square foot project. The design firm, Poore & Company, specializes in "integrated architectural design" They are known for their sensitive use of color in creating richly layered interiors. Their trademark approach is holistically, integrating both interior and exterior environments while incorporating sound, green building practices. According to the stain contractor, Dan Rosa of Concrete Effects, the major challenges with this project were the tight timeline for completion and the unpredictability of reactive acid stains. 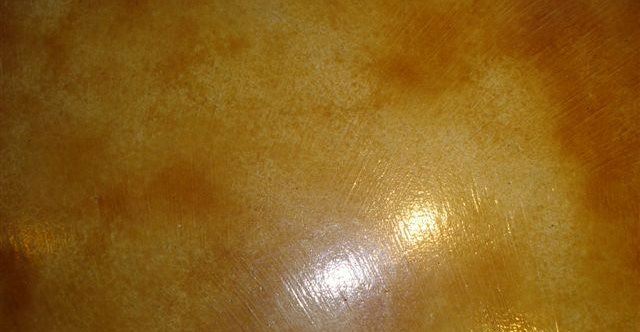 "Reactive stains are sought after because the results they produce are unique to each floor. No two floors are the same because the composition of the concrete is different each time," remarked Rosa. "However, the unpredictability is also the challenge. When you work with architects who require a very specific and sensitive color palette, and it is intended to be darker or lighter in designated areas, and also change from dark to light in other areas, then it adds extra time on a schedule with no room for delaying when the opening and access by other trades are scheduled." The design called for changes in the depth of color in specific areas. Jonathan Poore describes it this way, "The tint of the concrete was executed so that there is a soft wash of color moving from deep concrete stains in the darker, cozy interior spaces, to lighter stain tones toward the water. This creates a soft and subtle continuum of color, but with each area having its own feel and character. Deeper tones are in the recesses of the restaurant, while lighter tones blend with the bright light spilling in from the harbor. This allows diners to choose whether they want to nestle in a cozy corner or command the harbor in a light filled pavilion atmosphere that is connected to the outdoor environment by the glass curtain wall adjoining a new waterside promenade." Although the concrete had been allowed to fully cure for 28 days prior to stain application, in some areas the stain did not react as fully, so Rosa decided to use selective applications and faux finishing techniques to blend or darken areas to distract from any unevenness in the way the stain reacted to the surface. The project had been remodeled on various occasions over the past 60 years which presented additional challenges that Dan Rosa mentioned, "This concrete was more difficult because the stains reacted more or less where there were differences in the mix from one concrete pour to the next. The first application showed distinct differences where one pour stopped and another pour began." The Concrete Effects crew worked evenings and weekends to apply extra coats to the floor to blend the changes between one area and another to achieve the color depth wanted, and seal it well before the opening. Concrete Effects applied from two to four coats in a painterly manner to increase the variation and darken some areas. Dan Rosa was well suited for this challenge, because he became a stain artisan in 2002 after more than twelve years doing decorative wall treatments with paint and plaster. The skill level of a stain contractor is crucial to the success of the job. Before starting Concrete Effects he undertook hands-on training with Tom Schultz to learn about faux finishing as well as perfect the many different application techniques in his arsenal. For Latitude 43, Rosa used Kemiko's Stone Tone Stains which react with the free-lime in concrete to provide a mottled translucent patina. In the waiting area, Malay Tan was applied producing a suede-like appearance, accented with the rusty terra cotta tone of English Red to harmonize with the homey upholstery of the soft furnishings and area rugs. Golden Wheat, which produces a light tan with amber undertones, was used in the bright waterfront dining room. Near the bar area where the architects wanted darker coloration, English Red stain was applied in multiple coats for a deep shade that appears very aged and timeworn. 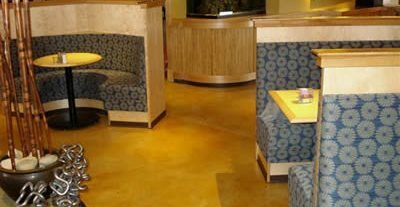 The stained concrete contributed to achieving the design intent and creating a popular and inviting gathering place for diners, that is also durable and low maintenance. "Overall, the stained concrete floor creates a varied but cohesive base for this unusual renovation," says the architectural designer, Jonathan Poore. "The colors harmonize seamlessly with the broad array of materials throughout the interiors - giving the unique historic location a dynamic and changing relationship to color and light. The warm stained concrete takes on a different character and feeling in the course of the day, always different depending on the progression of the seasonal angle of the sun." Many thanks to Poore & Company for their assistance with this story. 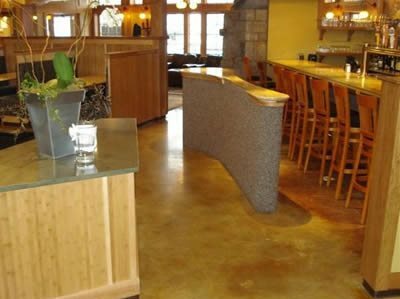 Concrete Effects specializes in creating decorative concrete floor finishes, as well as countertops, mantles, bathrooms, tub surrounds, shower stalls & furniture. The company works on both residential and commercial project in the North East, from New York to Maine.